The service was superb. Delivery the next day... even better. Find out how our new line of multi-purpose wall plates can save you time and money! It used to be that customers always asked for a HDMI wall plate or a VGA + 3.5mm audio wall plate to perfectly finish off their home theatre installation. There's nothing quite like a neat termination of cables right next to your projector, or a socket on the wall you can attach a computer to for display on a large screen TV. But as home theatres have become ever more complex multimedia hubs, requests for highly specific combinations of terminals on wall plates has outpaced our ability to stay ahead of trends. Both our Bullnose and Brushed-entry wall plates benefit from universal cable compatibility - there are no terminals, no sockets and no limitations except for purely physical size constraints. You can run video next to audio, digital next to analogue and electrical lines next to optical cables and feed them through the same plate. Fewer holes in the walls is always a good thing! Each wall plate has a different maximum plug size it can accommodate, so check the links below for full details on each product page. Fewer cables = fewer dollars. In traditional wall plate setups, you need three cables and two wall plates for a complete link from source to destination. 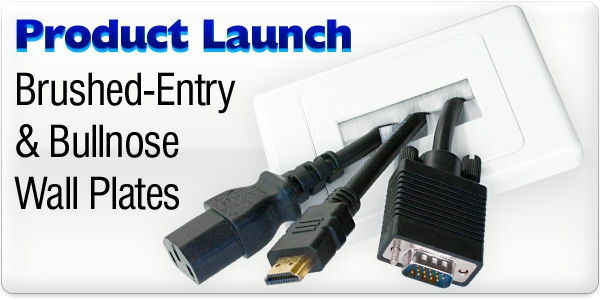 With Bullnose and Brush-Entry wall plates, you can make do with a single, longer cable threaded directly between hardware components. This configuration can of course save you money, but even more importantly it gives your hardware the best possible link for signal fidelity. Without any breaks in the line for the wall plates, there are fewer opportunities for bandwidth loss or resistance spikes. While this may not solve every problem with image or sound quality, it helps eliminate potential problems. Simpler is better! Both of these wall plates allow you to leave some slack cable inside your wall so that changes to your home theatre equipment in the future don't result in all-new cabling being required because the position of the outlets has changed. With our brushed-entry models, the dust in your walls is even less likely to be pulled through with a cable, eliminating clean-up on small adjustments. All four plates in the range are available in white, and can be attached directly to plasterboard or to cable boxes inside the walls depending on your needs and access. Accessories vary between each type, so be sure to check the specs and additional photos available on the individual product pages. When it comes to easy in-wall installations, this is a great place to start! Need to know more about how long your cables can be? We have a blog article detailing how far many common cables can go, and if that limit can be broken! Read Going the Distance - A Guide to Maximum Cable Lengths.